Deep carbon science graces the cover of Science (13 October 2017) and Nature (28 September 2017). 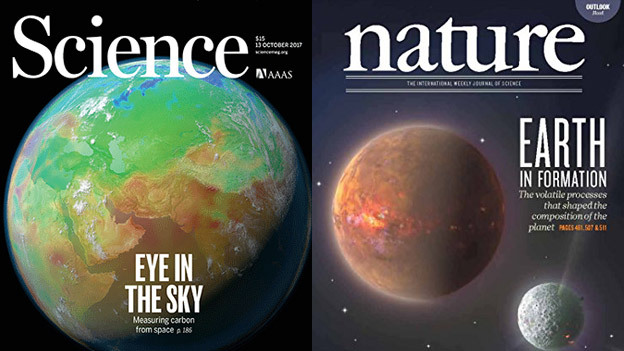 Science that may transform our understanding of the deep carbon cycle is featured on recent covers of Science and Nature. DCO Reservoirs and Fluxes Community members Florian Schwandner (Jet Propulsion Laboratory, California Institute of Technology, USA) and Simon Carn (Michigan Technological University, USA) are among the co-authors of a landmark paper in Science reporting the first detection of passive degassing of volcanic CO2 from space, which has been identified as a grand challenge in volcano science. Their paper is part of a special issue, “Eye in the sky: measuring carbon from space,” containing initial results from NASA’s Orbiting Carbon Observatory-2. Spaceborne measurements complement but do not replace ground-based measurements of volcanic emissions of CO2. DCO scientists also published important papers on ground-based measurements of volcanic emissions of CO2 in Italy and East Africa. We are excited to announce that the inaugural Gordon Research Conference (GRC) on Deep Carbon Science will be held from 17-22 June 2018 at Bryant University in Rhode Island, USA. This biennial conference will extend the legacy of DCO International Science Meetings beyond the end of the DCO decadal program. In future years, early career scientists will be eligible to propose an accompanying Gordon Research Seminar on Deep Carbon Science, which would extend the legacy of DCO Early Career Scientist Workshops. Congratulations to our DCO colleagues Magdalena Osburn (Northwestern University, USA) and Laurence Yeung (Rice University, USA), who have been named among 18 of the USA’s “most innovative, early-career scientists and engineers” as recipients of the 2017 Packard Fellowships for Science and Engineering. Each Fellow will receive $875,000 over five years to pursue their research. These awards signify a bright future for deep carbon science. A large contingent of DCO researchers will participate in the AGU Fall Meeting on 11-15 December 2017 in New Orleans, USA. This day-by-day listing will help you find sessions, talks, and posters of interest to DCO scientists, as well as those featuring members of the DCO Science Network. To add items to these listings, please contact the DCO Engagement Team. Join modeling and visualization expert Louise Kellogg of the University of California Davis, USA who will provide a virtual "construction manual" for how to create a box model. The Geophysical Laboratory of the Carnegie Institution for Science invites applications for postdoctoral fellowships. The Geophysical Laboratory emphasizes interdisciplinary experimental and theoretical research in fields ranging from geoscience, microbiology, chemistry, to physics. The Laboratory supports world-class facilities in high-pressure research; organic, stable isotope and biogeochemistry; mineral physics and petrology; and astrobiology. Carnegie Postdoctoral Fellowships are awarded once a year. The deadline for submitting an application is 1 December 2017 and the position begins the following summer or autumn.